Over the last 12 months, AutoSpeed has carried out a 25,000 kilometre test of the APEXi Power FC engine management computer, supplied to us by JAP Trading. We've driven the car in ambient temperatures as low as 4 degrees C and as high as 45 degrees. At 260 km/h and at 5 km/h. When trying to extract the maximum distance from a tank of fuel - and when trying to extract the maximum number of kilometres from each hour. AutoSpeed staffers have driven the car, mechanics proficient in programmable management have driven the car, and people who regard a car as nothing more than transport have driven it. In short, this is a real-life test where every type of driving has been undertaken by a variety of people. 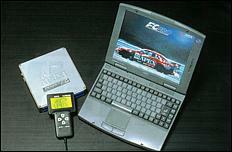 On test was the PFCRB26, which is suitable for the R32 and R33 Nissan Skyline GT-R models. (A full list of the engines for which Power FCs are available is shown at the end of this feature.) Power FCs suit only Japanese high performance engines - none are made for European, Australian or US engines. The test Power FC measured 170 x 155 x 33 mm (HxWxD), making it a little smaller than the standard Nissan ECU in the GT-R. 'APEXi' is attractively stamped in the brushed alloy cover plate used on one side, meaning that the ECU could be prominently mounted for appearance, if that's desired. 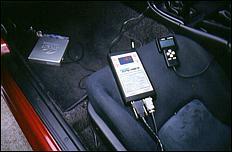 Inside, the APEXi unit is obviously much more electronically modern than the late-Eighties standard Nissan ECU. Extensive use is made of surface-mount components, for example, and unlike some plug-in ECUs, the component count and board complexity remains high. 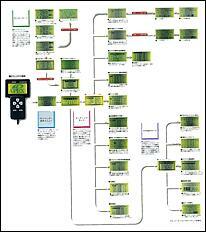 The APEXi Power FC is optionally supplied with a backlit handheld pendant LCD-type programmer. This uses a 60 x 30 mm dot-matrix LCD display, four arrow buttons and also 'previous' and 'next' buttons. The size of the LCD display and the dot matrix format means that far more information can be shown on the screen than is common with handheld pendant-type programmable ECU controllers. However, no handheld pendant can compare for information density with the amount available on a laptop PC colour display. Although there is a PC link and appropriate PC software available for the Power FC, apparently the software is in Japanese and so is not sold outside of Japan. 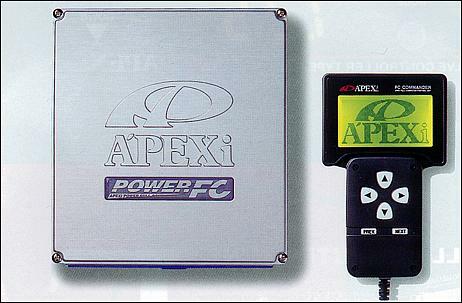 This is the most major limitation of the APEXi Power FC - there's no optional English-language PC interface. The pendant is used for three functions - displaying engine data ('Monitor'), displaying and then reprogramming engine management maps ('Setting'), and an 'Etc' (sic!) mode. In its Monitor mode, any two of the following factors can be displayed on the screen: Injector Duty Cycle, Ignition Timing, Airflow Meter Output Voltage, Engine RPM, Road Speed, Boost Pressure, Knock Sensor Output, Coolant Temp, Intake Air Temp, and Battery Voltage. The pair that is displayed can be selected, so you can have Boost and Knock Sensor output, for example. In addition to displaying this data numerically in real time, a line graph function can be enabled, allowing the easy spotting of spikes, such as those occurring in the knock sensor output when detonation occurs. The Monitor function works quite well, and is one reason why many people mount the pendant permanently on the dashboard as a multi-function instrument. Compared with buying and installing a LED or LCD intake air temp gauge, for example, using the APEXi pendant makes good sense - the sensor is already installed and no extra wiring is needed! However, it is the Setting menu that is of greatest interest - this is the one that allows re-programming of the management maps. The following maps are able to be altered: Ignition Timing, Injector Opening Time, Airflow Meter Type, Injector Trim, Boost Pressure, Acceleration Enrichment, Ignition and Injection Correction, Cranking Enrichment, Coolant Temp Injection Correction, Rev Limit and Idle Speed. While this looks extensive, there are some notable exceptions. For example, there is no intake air temperature correction chart for the ignition timing, no deceleration enleanment control, no running (ie not just start-up) intake air temperature fuel correction control, and so on. These maps almost certainly exist in the software, but they are not accessible - at least, not via the hand-held pendant, anyway. In addition, there are a number of other screen displays - the Etc bit! Sensor Check displays the output signal from each of the engine sensors, so that they can be seen to be working appropriately. Function Select enables some very important features - the Check Engine light can be flashed if certain parameters are exceeded or certain conditions occur. For example, it can be set to flash when detonation is detected, or the injector duty cycle is excessive. Closed loop operation (ie the oxygen sensor being used to control light load and idle mixtures) can be switched on or off. Finally, the contrast and brightness of the LCD display can be adjusted. We unplugged the standard Nissan RB26DET ECU and plugged in the Power FC. Unfortunately, the car wouldn't then start - not quite what we had expected. We returned the ECU to JAP Trading, who sent it back slightly re-programmed. The car then started without problems, but we soon learnt what the original problem had been anyway - while playing with the controls, we recreated the problem. If the Power FC is set to work with an APEXi boost controller - but one isn't actually fitted - the engine will constantly stall, or not even start. Mmmm! With the ECU set to 'non boost control' status, the engine started and ran sweetly, using the maps already programmed into the Power FC. 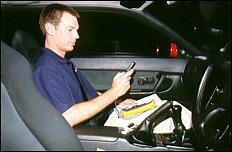 We enabled the flashing of the Check Engine light when detonation was detected and went for a drive. 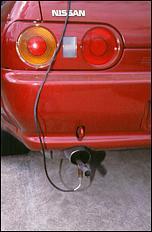 It soon became obvious that the ignition timing was too far advanced for Australian Premium Unleaded fuel; the Check Engine light flashed repeatedly when high rpm and loads were used. Rather than progress further without an indication of the actual air/fuel ratio, we put further driving on hold until an accurate Autronic air/fuel ratio meter and dedicated oxygen sensor could be borrowed. Adelaide company Awesome Automotive kindly provided us with a meter, and then further tuning continued. Effectively standard but for a cold air intake and a very minor increase (2 psi) in boost pressure, the Skyline with the factory Nissan ECU ran air/fuel ratios as rich as 10.9:1 under full load. The standard program in the APEXi Power FC leaned this out a little - a good thing - and had mixtures throughout the rev and load range that were appropriate to a road-going car. However, as indicated, the ignition timing had to be pulled well back at high loads, although in off-boost conditions it was a little too retarded. The coolant temp start-up chart, injector trims and so on we left alone. Programming of revised calibrations can be done in real time on the road or dyno - there are no stutters or misses when the new data is programmed in. However, the most major difficulty that we found was in working out where we were in the fuel and ignition charts - there is no indication (eg by highlighting the correct digits) of which data the ECU is accessing at any one load. Instead, there are load and rpm axes with arbitrary numbers - not actual rpm and manifold vacuum/boost, for example. This means that until some relationship between these axes and the actual load/rpm characteristics of the engine is gained, changes are a little hit-and-miss. With the engine running on slightly leaner maps and with more mid-range ignition timing than standard, was there a dramatic power increase? No - and you wouldn't expect it on just a mildly modified engine! What could be sensed was better responsiveness off boost, especially in fourth and fifth gears at low rpm. But - even more importantly - there was absolutely no reduction in driveability, ease of starting, or fuel usage. And talking about fuel consumption - or part-throttle mixtures - it needs to be stressed that the Power FC was capable of a wide range of mixtures; unlike some programmable ECUs, the mixtures didn't go full rich at the hint of a wider throttle opening. However, the Power FC - like the Nissan factory ECU - doesn't have a lean-cruise mode. After using the Power FC every day for a year, it was interesting to go back to the factory ECU. The difference was extremely slight; if being super-critical we thought that the factory ECU had just a touch better idle stability. However, the Power FC still coped brilliantly with idle loads like the air con and power steering inputs. In terms of the engine tuning, for the first two months of the test there were almost no problems - the exception being that just once or twice the Check Engine light flashed to show that the ECU had detected detonation at about 3000 rpm on medium throttle openings. (Note that detonation was never audible - the ECU apparently retarding timing when detonation was sensed.) However, when the same throttle position and load were deliberately recreated, no detonation could be made to occur, so we didn't do anything about it. The test commenced in winter and, by the time the hot summer arrived, we were confident that the ECU was programmed almost perfectly. The car had no flat spots, started just as it did on the standard management and generally behaved so well that mechanics who drove the car did not believe that it had a programmable ECU in it! The punch line is that at the height of summer, the flashing 'detonation detected' light went mad, but only ever when climbing one totally unexceptional hill!In all other conditions the ignition timing was correct, but climbing this particular hill caused just the right combination of throttle, load and engine rpm to trigger the ignition timing that was a tad too far advanced. And the hot weather tipped it over the edge so that it became a noticeable problem. If an ignition timing correction chart had been available, this could have been revised to retard the timing a little more with increased intake air temps - but as mentioned previously, no such chart is accessible. When the GT-R was Nissan dealer serviced, we asked that the Nissan CONSULT tool be plugged in, as is usually done to check for logged faults in the standard ECU. The Power FC did not accept the service tool and in fact appears to have no self-diagnosis facility at all. The APEXi Power FC is really quite staggeringly good. It comes 90 per cent pre-programmed (at least for standard and mildly modified engines), plugs straight into the loom, and works beautifully with the rest of the management system. We quite expected to uncover major starting or driveability problems over the course of the 12 months and were gratified when none appeared. When you consider that the wiring and installation of the programmable ECU takes only minutes and requires no new sensors or actuators, the price becomes substantially cheaper than it first appears - and anyway, they're not expensive to start with! With a PC link and appropriate English software the Power FC would be damn' near perfect; as it is, we very highly recommend it.